Today, I’m going to talk about the verb “believe”. I’ll focus on the difference between “believe” and “believe in“. First, if you believe something, you think it’s true, correct, or real. When I say “I believe you”, that means I believe what you say, or what you say is true. When I say “I don’t believe that story”, I don’t think the story is true. Now, “believe in” has two meanings. First, if you believe in something, you think it exists. You believe in god. You don’t believe in miracles. 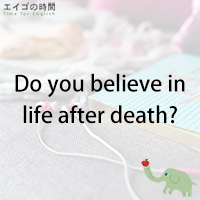 Do you believe in life after death? To believe in also means to be confident that something is good or right or effective. For example, you’re not on Facebook. You’re not on Twitter. You don’t believe in SNS. John doesn’t believe in marriage. Naturally, he’s not married. Next Post 自分を信じて！ – Believe in yourself!